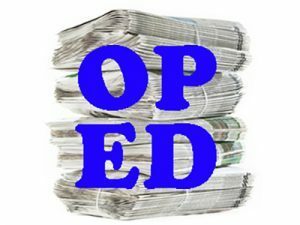 Education for Reconciliation update – Exciting meeting in Manitoba! Education for Reconciliation (E4R) is picking up steam in Manitoba! The KAIROS Cambrian-Agassiz regional coordinating group recently met with MLA Nahanni Fontaine, who is happy to champion Education for Reconciliation in Manitoba. Ms. Fontaine is Status Ojibway from the Sagkeeng Anishinaabe First Nation in southern Manitoba. She is providing the KAIROS group with guidelines and advice on options to present the petitions in the Legislature. Kudos to Ellen Wood, Verna Stacey, Kerry Saner-Harvey and Carin Crowe, who are part of the group, and to Paul Gehrs from the KAIROS Steering Committee. They are gathering information and advice to determine next steps forward. We will keep you posted! KAIROS is hosting a five-person delegation from the Philippines, March 20 to April 5. 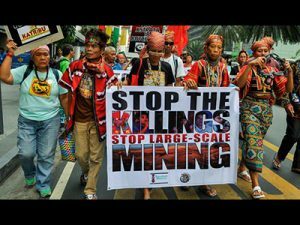 The delegates will visit several Canadian cities to speak about human rights violations in the context of mining projects, including Canadian-owned operations. They are also hoping to build support for the ongoing peace talks between the Government of the Philippines and the National Democratic Front. The tour includes stops in Ottawa, Calgary, Edmonton, Winnipeg, Toronto and Montreal. Read more. 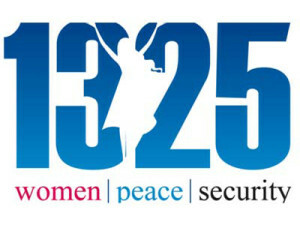 KAIROS welcomes the Canadian government’s response to the report of the Standing Committee on Foreign Affairs and International Development, which reaffirms the critical role of women and women’s rights organizations in peace building. Read more. 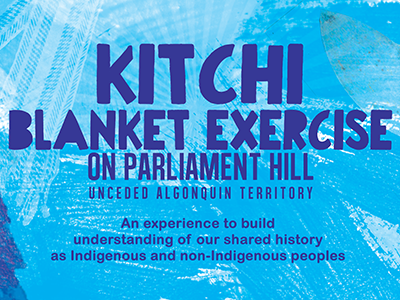 Join us on Parliament Hill on June 2 for the largest Blanket Exercise ever! Kitchi means “really big” in Anishinaabemowin. 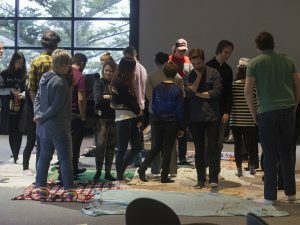 The Blanket Exercise is an experiential way to build understanding of our shared history as Indigenous and non-Indigenous peoples in Canada. The event will mark the 2nd anniversary of the TRC’s Calls to Action and the 20th anniversary of the KAIROS Blanket Exercise. It will also provide a perspective on Canada 150 that is different from many events taking place across the country. 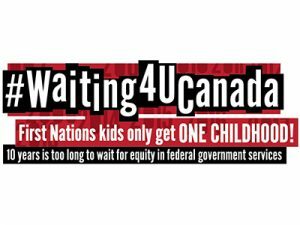 For those unable to be in Ottawa, stay tuned for the opportunity to bring focus to this anniversary in your own community on Sunday, June 4. Together we can make sure the TRC’s Calls to Action remain central to our reconciliation conversations. We look forward to marking this anniversary with you! A partnership between KAIROS and the Assembly of Seven Generations. When it comes to ending discrimination against children, there is no excuse for half-measures and no time for delay. Read more. KAIROS is one of many organizations that signed this open letter. Can improved agricultural practices help fight both climate change and hunger? Yes, according to one of the world’s most esteemed climate scientists. Read more. Last March, the University of Guelph announced it would be hiring five new Aboriginal professors and increase financial support for Indigenous scholars and graduate students. As part of her new graduate class, Contemporary Aboriginal Issues, Dr. Sheri Longboat reached out to KAIROS Canada to run its Blanket Exercise to provide an interactive and experiential overview of the Indigenous history of Canada. Read more. 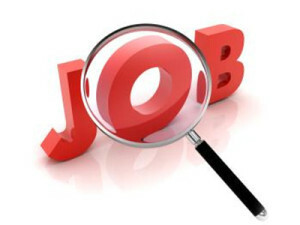 In the context of KAIROS’ vision and mission, the Fundraising Coordinator will be responsible for developing and implementing key fundraising projects, including an annual plan for grant fundraising, a program for planned giving, and a digital fundraising program. Read more. Hosted by Victoria College, KAIROS, and the Student Christian Movement. 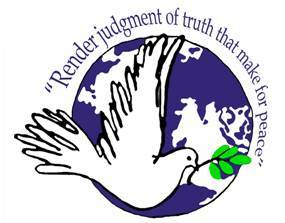 The Ecumenical Voice for Human Rights and Peace in the Philippines (or EcuVoice) is an alliance of faith based institutions and human rights defenders. EcuVoice’s work is focused on advocacy, education, lobbying and promoting policy reforms on human rights issues that affect the marginalized sectors of Philippine society. EcuVoice is active in campaigns on peace, social justice, the defense of civil and political rights, the impact of mining and militarization on women and children, protection of the environment, and the right to self-determination of national minorities, to name a few. 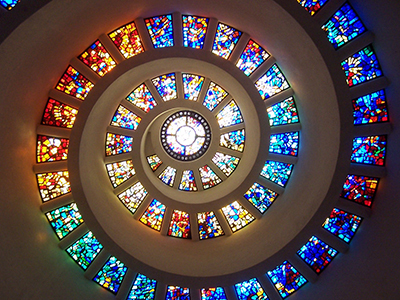 It is composed of the following: National Council of Churches in the Philippines (NCCP), Karapatan, Ecumenical Bishops’ Forum (EBF), Promotion of Church People’s Response (PCPR), Task Force on Urban Conscientization (TFUC), National Union of People’s Lawyer (NUPL), Philippine Peace Center, and Contak Philippines and the Workers Assistance Center, Inc. Learn more. KAIROS in co-operation with the United Church’s BC Conference Contemplative Justice Network is pleased to announce the release of several new resources on the social and ecological justice issues associated with hydraulic fracturing (fracking) and liquefied natural gas (LNG). 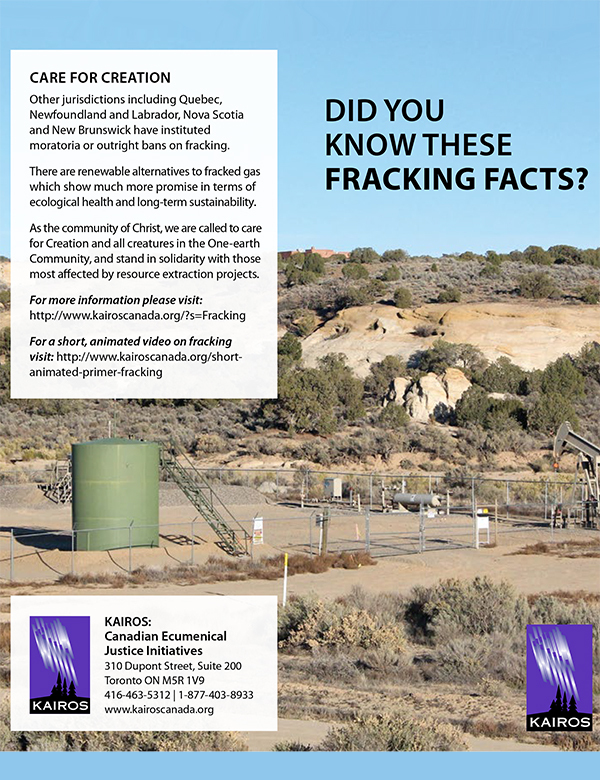 These pamphlets and posters are meant as an introduction to issues that were initially explored in the KAIROS discussion paper Ethical Reflections on Fracking (February 2015) and further examined at the October 2015 Fracking Forum held simultaneously in Moncton N.B. and Vancouver B.C. The production of these resources is timely as debates on fracking and LNG are currently heating up in British Columbia. It is risky in this season for pastors to talk about Murdered and Missing Indigenous Women and Girls, risky to be working to get congregants to set aside Christian Church budget-money to tour a (former) residential school, risky to be coaxing most-beloved “old people in the pew” to rethink ancestral narratives that are foundational to settler peoples. When colleagues risk in such ways it seems to me that they are letting Epiphany light shine in the darkness. Read more. In 2017, Lutherans worldwide are commemorating the 500th anniversary of the Reformation spearheaded by Martin Luther in 1517. With the assistance of the printing press, Martin Luther’s 95 Theses became the historical document to spark changes in the church. Read more. A few weeks ago I was reading about Connie Greyeyes. The interview and accompanying Amnesty International Canada report, Out of Sight, Out of Mind, keep coming back to me whenever I think about community. Read more. In 2015, Bishop Susan Johnson, National Bishop of the Evangelical Lutheran Church in Canada, The Rev. Dr. Willard Metzger, Executive Director, Mennonite Church Canada and I, The Rev. Dr. Karen Hamilton, General Secretary of The Canadian Council of Churches, took to the road for the Church Leaders Justice Tour 2015. Read more.